Here’s the truth: When using referral marketing program to boost app downloads, it is very important to keep your users constantly engaged and I’m sure that you’ll nod in approval. Devising a referral marketing campaign for a mobile app requires much effort. As a marketer/developer, one has to tick all the right boxes to gain the most from a campaign. Timely promotion has been regarded as the most significant metric and the same holds true for your mobile app referral program as well. It’s simple.Better promotion would bring better engagement and more users! 1) Use push notification to reach all your app users at a single go! Push notifications can be used to inform and update users about your referral program. Push notification work with both new and dormant customers and a great way to remind your users about the ongoing referral program. Most mobile apps have a website and a mobile site that receives consistent user traffic. 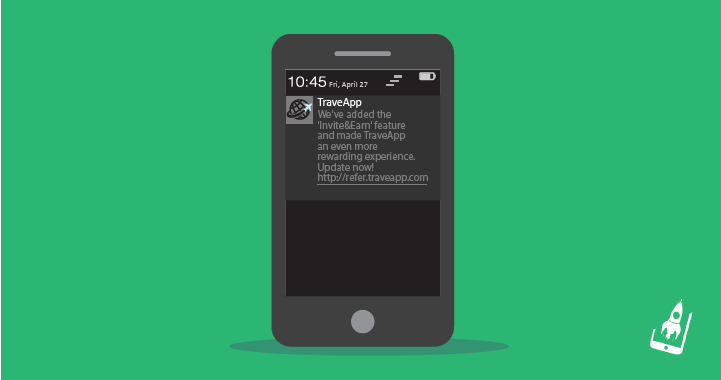 These visitors can be great ambassadors of your app referral program. Therefore, it makes a lot of sense to have a banner/pop-up that informs users about an existing ‘refer and earn’ program that’s been running on your mobile app. 3) Add images for social actions like FB, Twitter, etc. 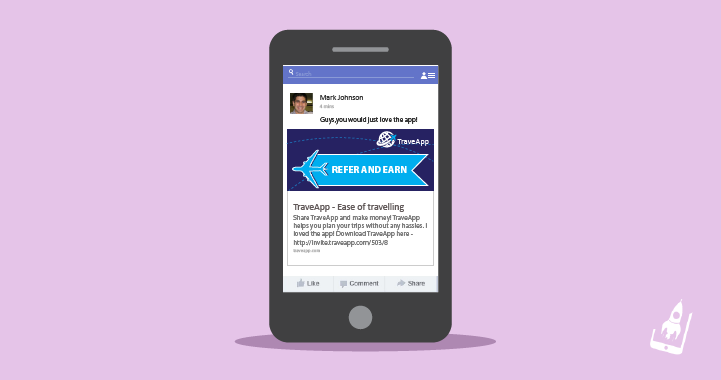 Social sharing is the quickest and easiest way to promote your referral program. Adding images for social actions will facilitate users to take prompt action on your referral links and increase the visual appeal of your ‘refer and earn’ prompts. Add images for social actions like FB, Twitter, etc. If you want to amplify your referral program make sure that it has an exciting and powerful content copy. It should be such, that it excites social users to click on your link as soon as they sight it on Facebook, Twitter or any other social platform. To do so, make sure that the message is crisp and engaging at the same time. App developer can create prompts for the user. An ideal way of doing this is through creating a popup or notification within the app and asking users to invite friends and earn from the referral program. AppVirality helps you create these popup/notifications and trigger them at the right point in time asking to refer their friends. You can make use of in-built user targeting rules to trigger these notifications to the right users at the right point in time. Another way of promoting a mobile app referral program is by sending a round of SMS to your registered users and updating them about the app’s ‘invite and earn’ program.Before doing so, it is advised to scrub and filter the data, since many users may be registered under ‘do not disturb’ category. 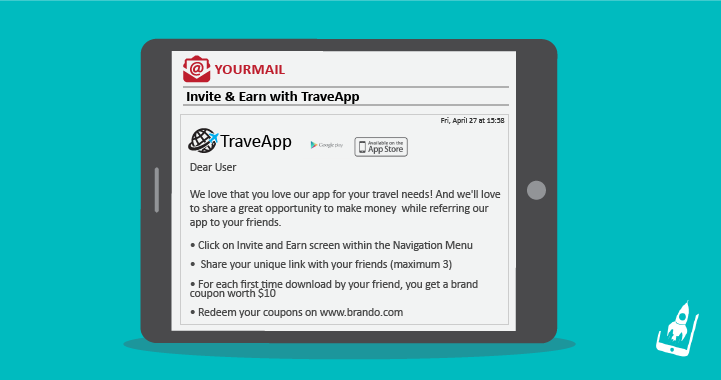 Once you have users on board, use this opportunity to engage with them by sending them an ‘Invite and Earn’ newsletter! This newsletter can have tips on how to execute app referral links and other important information that you wish to share with your users. 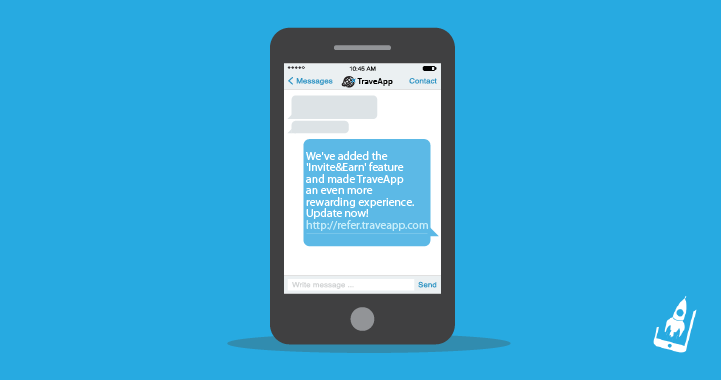 What are the different ways you’ve been promoting your mobile app referrals? Are there any pointers that we’ve missed? We’ll love to explore more ideas, so drop us a line in the comments below. Looking for an app referral program? Talk to our experts now!